Animated summer live wallpaper – beautiful free animated screensaver with beautiful summer loan landscape, falling leaves, iterative flying dandelion seeds, animated bubbles and much more. 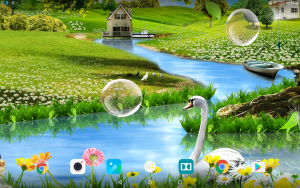 This free summer live wallpaper is an excellent choice for summer time. Download it for free now and enjoy all the beauty of calm sunny summer day on the beautiful flower meadow.